Anabantoids or Labyrinth fish are air breathing fish with the adaptation to directly breathe atmospheric air with the help of the labyrinth organ. Anabantoids belong to the suborder Anabantoidei of the order Perciformes. All these air breathing ornamental fish species posses labyrinth organ which is a special adaptation for breathing atmospheric air. 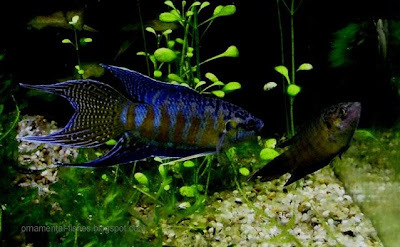 These ornamental air breathing fish are endemic to African and Asian freshwater lakes and streams. 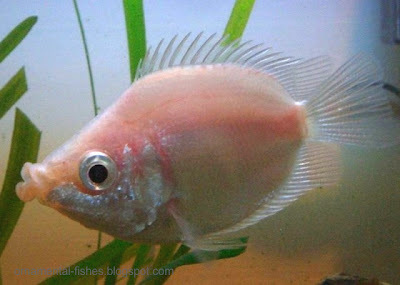 These ornamental fish are concentrated in tropical and subtropical waters. In Asia there are many ornamental anabantoids and are found throughout the regions of South, south-east and East Asia. In Africa there are less number of species and are concentrated in the tropical rain forest regions. These ornamental anabantoids are well adapted for warm and still or slow-flowing waters with low oxygen levels. The size of the labyrinth organ is a indicator of the environment of the species. Species evolved in the oxygen rich waters have smaller labyrinth organ whereas the species of oxygen starved regions have developed larger and elaborate and complex labyrinth organs. All the colourful and lively siamese fighters (betta), gouramis and paradise fish are very popular aquarium fish in the ornamental fish trade. The labyrinth organ is the expansion of the bone (epibranchial) of the foremost gill arch which is vascularised for breathing. Breathing directly from the atmosphere, air gets diffused into the blood flowing in the vascularized area in the labyrinth organ and required oxygen is absorbed for biological activities. Apart from labyrinth organ these ornamental anabantoids also can make use of their gills for respiration. When these labyrinth fish are out of water they can survive for short durations, breathing atmospheric air. However on longer exposure, these air breathing fish loose body water and moisture and get desiccated and die. These organs are not functional when they are born. These ornamental fish in their fry stage rely only on their gills for breathing. As these anabantoids grow up the rudimentary organ also develops and grows to becomes functional. These ornamental anabantoids are hardy and are easy types for hobbyist. As these anabantoids can respire from air, aeration of the tank is not a limiting factor. However the siamese fighters are to be kept in isolation due to their temperament of attacking other species. 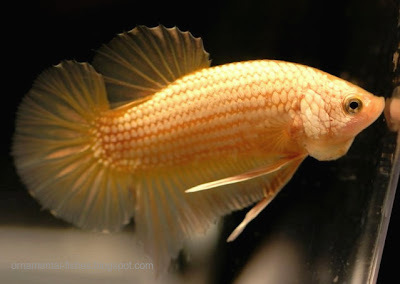 Other labyrinth fish are usually peaceful and are suitable for keeping in community aquarium. Sometimes air breathing paradise fish become territorial during breeding season. These ornamental anabantoids may be better kept in a large aquarium. Though these air breathing pets are primarily carnivorous they can be adapted to take formulated feed, usually a high protein diet. The air breathing anabantoids will readily accept live worms and larvae. To get good colouration they may be fed frequently with live or dried worms. Breeding: Males build nest with bubbles and the female releases eggs into the nest. After fertilizing, the male guards the nest and later the fry. In some forms the males are mouth brooders. The minute fry are delicate and require zooplankton for their survival. Unlike the parents these fry are very sensitive to water quality and conditions. These ornamental anabantoids fish fry require proper aeration of the water.